Voters in Montana are fired up and ready to throw Republicans out of office. And they love Rob Quist. Rob is a true progressive populist -- he supports Medicare for All, he's pro-choice, and he opposes Citizens United. And he is running an incredible campaign right now. He has been holding listening sessions and rallies in counties all over Montana, and his message is clearly resonating. Rob's opponent is one of the Republicans' weakest recruits -- a New Jersey tech billionaire and perennial failed candidate who lost in November to a Democratic governor even as Trump won the state. So we know that this race is winnable. 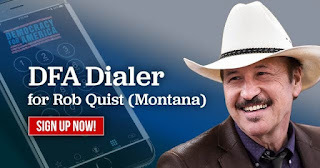 DFA members are having a real impact this special election: Together, we made more than 13,000 calls for Rob Quist on DFA Dialer last weekend alone. Can you hop on DFA Dialer this weekend to help set the stage for a big win in Montana? Republicans are getting EXTREMELY nervous this race. Late last week, the Congressional Leadership Fund -- a super PAC aligned with House Speaker Paul Ryan -- announced a massive $800,000 ad buy to defeat Quist. And that's on top of the $1.2 million the National Republican Congressional Committee plans to spend in Montana between now and Election Day. It's no surprise that deep-pocketed GOP donors are trying to get ahead of the curve on this race, after being taken by surprise by the incredible wave of Democratic grassroots momentum in Kansas and Georgia. They're not waiting until the last minute -- they want to overwhelm Quist's campaign with a flood of cash and false tv ads now. 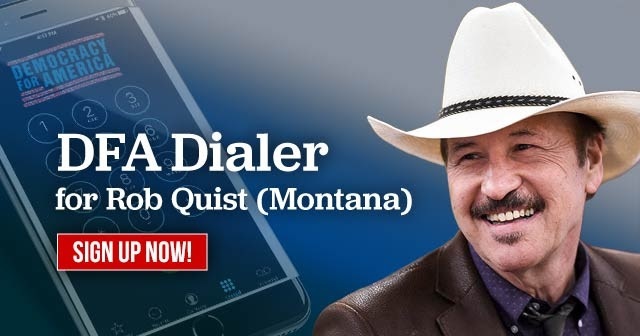 Sign up to make DFA Dialer calls for Rob Quist and help a progressive populist pick off this GOP House seat. 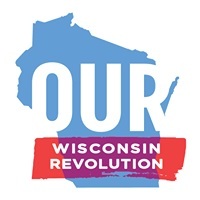 Thanks so much to everyone who attended Our Wisconsin Revolution La Crosse’s inaugural meeting! We had a great discussion about the unique role OWR can play in La Crosse by focusing on winnable policy initiatives on the local level. 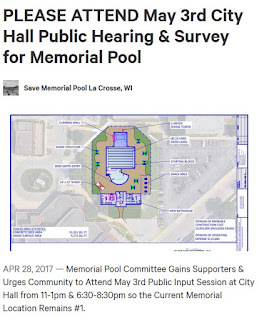 We think La Crosse can be a model for the kind of democratic community we’d like to live in: a Wisconsin government of, by, and for the people! 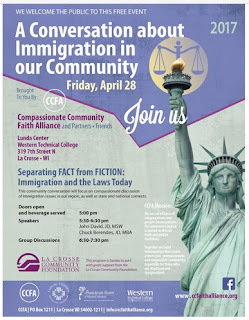 If anyone is planning to attend this afternoon's "free speech" event at UWL (apparently sponsored by a local right wing organization), you might want to read this report about how the Kochs and DeVos family are pushing racism and hate talk as "free speech" on college campuses. Free speech or license to discriminate? In response to fringe, far-right speakers often facing student protests, conservative legislators in many states are pushing “campus free speech” legislation. Two think tanks funded in part by the Koch brothers and Robert Mercer created a model bill, on which many of the state bills are based, that calls for harsh penalties, including expulsion, for students who disrupt guest speaking events. While enabling hate speech at colleges and universities, billionaire mega-donors are cracking down on students who publicly object to such speech. Meanwhile, the same wealthy conservatives’ family foundations fund ideological higher ed programs that serve their business interests. The Charles Koch Foundation, for example, gave $142 million to hundreds of colleges and universities from 2005 to 2015, largely toward free-market centers, professorships and courses. From these programs, Koch-funded think tanks and political groups recruit their favorite students to join the Kochs’ mass libertarian sociopolitical movement. There is a public hearing in Tomah this Tuesday at 1:00 PM on the permit request for a new wetlands fill and frac facility. It will be at the Park-Rec department in Tomah, 1625 Butts Avenue. 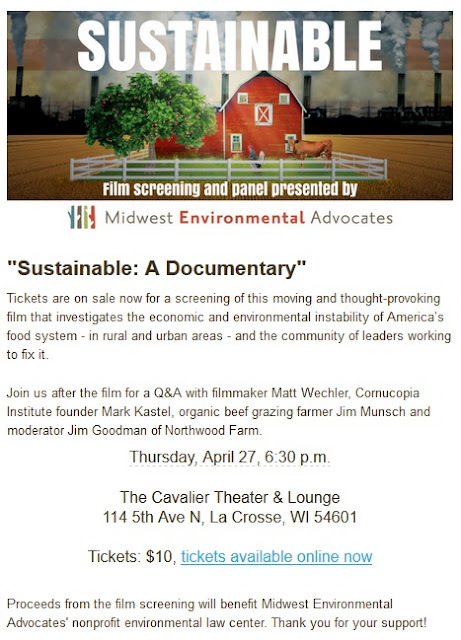 Check out Midwest Environmental Advocates' site for more info on project and history. If any area residents can make it out to this, the more resistance and information on why this is a terrible idea, the better. "We would like to recognize that the University of Wisconsin-La Crosse occupies the land of the Ho-Chunk people. Please take a moment to celebrate and honor this ancestral Ho-Chunk land, and the sacred lands of all indigenous peoples." The brief resolution makes a powerful statement honoring indigenous people and acknowledging the reality that our predominantly white university continues to occupy land that was stolen by European settlers from Ho-Chunk people, many of whom continue to live and be marginalized in La Crosse. Though simple words, it is an exciting step and one we hope will prompt reflection from other local institutions. Perhaps the City of La Crosse could adopt such a resolution. Unfortunately, the reality that we occupy indigenous land is too often far from the minds of white people in La Crosse, even in the progressive community. Attending the growing number of rallies over the past several months (for healthcare, immigrant and refugee rights, and other "resistance" events), it is hard to miss the nearly ubiquitously played sing-a-long song, "This Land Is Your Land" by Woody Guthrie. While we appreciate the eloquence of our community gathering and harmonizing together, this particular song is a racist affirmation of Manifest Destiny that the progressive community desperately needs to reconsider. While the song "This Land Is Your Land" may summon nostalgia among progressives, and appears to be a beloved tradition for many local activists, we believe it is important to think critically about who we are and what we are saying. So Coulee Progressives, can we find another heartwarming song? One that is maybe a little less racist? It is typically easy to see the racism of the right; they tend to be more forward and unabashed in their discrimination and prizing of white supremacy. Racism in the left is far more insidious, as many who identify as liberals, progressives, or even allies against racism are quite comfortable upholding white supremacist systems, even unaware that we are doing it. Local progressives and the Democratic Party still have a great deal of work to do in dismantling the racism inside of ourselves and our movement if we want to build the multiracial people-powered movement we need to transform this country. 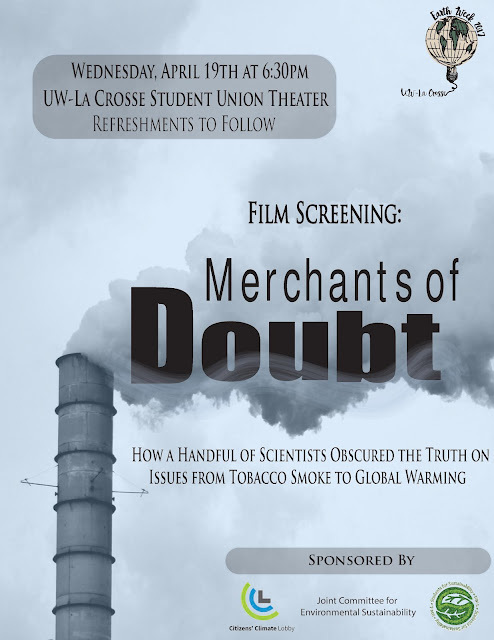 Wednesday 4/19 at 6:30 PM at the UWL theater, there will be a free screening of Merchants of Doubt. This film goes into detail about the climate denial movement, the money behind it, the deceptive tactics used, and the parallels to the tobacco industry's deception around the carcinogenic effects of smoking. It is a great film for anyone to learn how to explain why climate change misinformation is so dishonest and false, and how to sway people who may be influenced by these phony narratives. Please use this link to RSVP, thank you. Thursday, 4/20, The Alternative Truth Project will be performing the Chicago Conspiracy Trial at the Pumphouse at 7:30. Centered on charges leveled on protestors and anti-war demonstrators during the 1968 Democratic National Convention in the Windy City, this play is documentary-style, as the actual court transcripts are used in the script. The event is free, come check out this new artistic movement in La Crosse! As local election season comes to a close this spring in La Crosse, it seems like a good time to talk about what a progressive is. 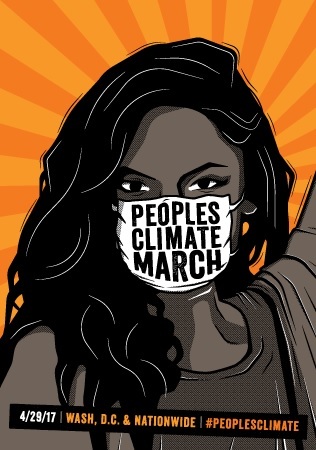 It seems like "the left" can be broken down further and further in small political pockets, such as environmentalists, racial justice organizers, socialists, feminists, civil liberties activists, union and labor rights organizers, etc. We all know that it is tough to unite progressives, and clearly define what makes us different from liberals, centrist democrats, new democrats, and all the other non-progressives we may share a party or candidate with at times. One resource that takes a stab at defining progressives is George Lakoff's Don't Think of an Elephant. He uses the metaphor of the family unit to illustrate progressivism. Lakoff's argument is that progressives believe in nurturing others to pursue what they want in their lives, while conservatives believe in strict obedience and conformity. Consider the simple difference between strict (conservative) and nurturing (progressive) parents. Progressives value a growth-oriented mindset. When looking at political candidates now and in the future, try to keep this basic framework in mind. The self proclaimed progressive candidates might just be another strict leaders in sheep's clothing.